For the last few weeks, I’ve noticed that I’ve been getting an influx of spam calendar invitations to my iCloud account, often from random counterfeit retailers. “Save 20% on UGGs” one says. “$19.99 Ray-ban&Oakley Sunglasses,” says another. I’m not the only one. Users across the web have complained about this influx of spam. The New York Times even covered it. And when The Times is on it, you know it’s a real thing. The problem—which is also infiltrating iCloud Photo Sharing—occurs because macOS and iOS automatically scan your inbox for calendar invites. 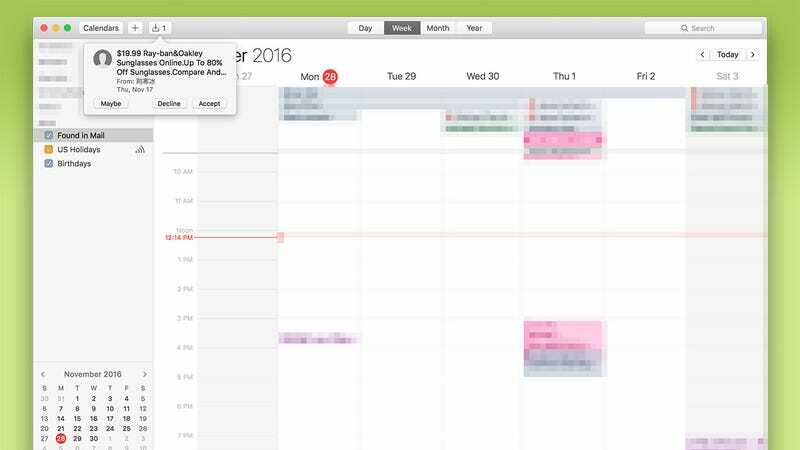 Users are then prompted to accept the invitation directly on their calendar. This is a great feature, most of the time, because it saves you having to search your inbox for invitations. But it can get really annoying when you get an influx of spam invites to sales for UGGs or Ray-Bans. We’ve reached out to Apple to see if they have any plans to help stop the influx of spam, and we’ll update this post if we hear back. In the meantime, there are few things you can do to stop the spam from being such a nuisance. You can hit “decline” on the calendar invite, but all that does is let the spammer know your email address actually works. That’s NOT a good idea. Instead, there are a few solutions that the Stack Exchange group has worked out. The first solution is to create a new calendar called “Spam” and send all the spam invitations there. Then delete that calendar. That’s a solution, but not a great one. The second solution is to disable the auto-add calendar feature from your iCloud account. To do this, you have to go to iCloud.com and login with your iCloud info. 3. Scroll down to Invitations and select to option to receive event invitations via email, rather than as an in-app notification. Again, the downside of this option is that you won’t see any automatic pop-ups of good calendar invites either; you’re stuck going to email like an animal. The best solution would be for Apple to allow people to mark calendar invites as spam—or to adjust its spam algorithm to prevent those calendar invites from hitting our inboxes to begin with.